Within the framework of its "Partner Center of Expertise" certification program, SAP has once again placed its trust in Keyrus to provide full support and maintenance for its solutions. 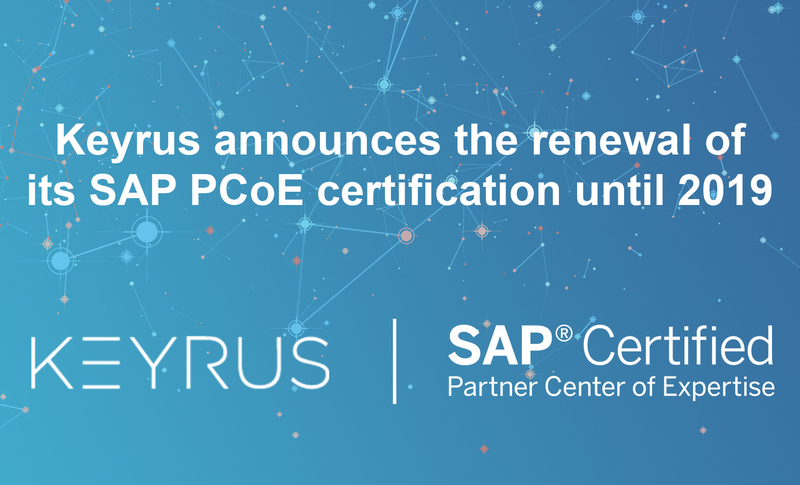 Keyrus, has obtained the renewal of its SAP PCoE certification in France until 2019. Having first been certified as a PCoE back in 2013, Keyrus can now announce that it has once again been given this distinction, and has, in the process, become an "SAP-approved Support Center" for BusinessObjects and SAP Hana. In this context, Keyrus will, from now on, be providing its clients with their corrective and development maintenance for the SAP BusinessObjects and SAP Hana software. Keyrus has been a partner of SAP for more than 20 years. This strong relationship is reflected notably in Keyrus's ranking as an SAP Gold Partner, the highest level of BI SAP certification, and its position as n°1 SAP BusinessObjects partner in France. The purpose of SAP's PCoE (Partner Center of Expertise) certification is to ensure the quality of the support service provided by the partner distributor. This audit assesses the level of certification of Keyrus's consultants on SAP technologies, processes for providing the support, and tooling, together with the degree of responsiveness and proactivity shown by the support teams. With this certification, SAP is giving Keyrus the right to provide its clients with the entirety of the services flowing from its "Standard" and "Enterprise" support contracts, but to do so in accordance with the approach, requirements, and quality norms imposed by the editor. "We are particularly proud to be announcing this third renewal of our PCoE certification. To obtain this accreditation, our teams had to be truly invested in the project over several months. This certification reflects Keyrus's commitment to this strategic partner", comments Clémentine HUET, Deputy General Manager, France, at Keyrus. "This announcement supports our development strategy whilst at the same time giving us an undeniable competitive edge, with the objective being very much to pursue and broaden our collaboration with SAP."